See all blog posts about Site 23051/Taylor Energy. This section of the SkyTruth Oil Spill Report site is dedicated to documenting the sorry history of what we call Site 23051 – the site of a former oil platform in the Gulf of Mexico (Mississippi Canyon block 20) that was destroyed by Hurricane Ivan in September 2004 and has apparently been leaking oil into the Gulf ever since from some of the 26 undersea oil wells that were once attached to the platform. 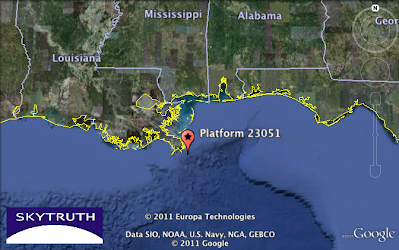 SkyTruth discovered the ongoing spill on May 15, 2010 as we were monitoring and reporting on the BP Deepwater Horizonspill. Since then we have been monitoring and reporting regularly. On October 12, 2011 Waterkeeper Alliance filed a notice of intent to sue the site operator, Taylor Energy. A complete history of news articles, pollution reports and observations of this site is published on our Site 23051 Chronology Page. Browse through our collection of annotated satellite images showing the many miles long oil slick appearing at site 23051 through the years from 2006 to the present.